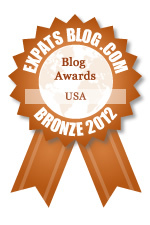 ExpatsBlog.com Expat Blog Awards 2012: USA Bronze Award! This blog won the Bronze Award for best expat blog in USA! Expat Mum gives fantastic expat take on US life - I really enjoy reading her observations. Toni has a warm, witty humorous blog that it always surprising and insightful. As a Brit living in the USA she has some fascinating observations on the cultural differences between the two countries sharing a common language. Check out her blog - I guarantee you will learn something while also being entertained! Can always rely on Expat Mum for a great read: funny, wide-ranging posts telling it like it is. She is just as comfortable writing about parenting or politics: this makes for an intelligent, enjoyable blog. Insightful, intelligent and engaging are all words to be applied to Toni, aka Expat Mum. Her blogs sometimes bring levity, sometimes pathos and are always worth reading! Not only is Expat Mum a great writer, but she's "not backward in coming forward" so she never shies away from the tricky subjects. Her writing is always entertaining, and reflects her honesty and integrity as a person - as well as her fantastic sense of humour. Do I think this blog has what it takes to WIN your Expats in USA Blog Award? Too right I do - and I defy you to show me a better candidate! A humorous view of what life is like for a Brit living in the US, and she's been around for a long, long time...I mean, the blog, you know, it's got longevity on its side and, well, Toni's not THAT old and...hey, look! 5 Stars! I've been reading Expat Mum's blog for five years or so. There's always a fresh take on a current issue. She makes me think, and she makes me laugh. I love this blog and the british humour of Toni. Being a French expat mom in Chicago too, I learned a lot from her blog and I also shares some of her intercultural experiences. It is always fun to read Expat Mum! I first discovered Toni four years ago through her book Rules, Britannia which I reviewed for my blog. I have continued to follow Toni's writing on Expat Mum which is the most enjoyable British expat blog I've found. It's fun to read Toni's observations of life in America delivered in a straight-forward, intelligent and humourous way. A must read! Expat Mum is one of the blogs that's reliably excellent, insightful and fun to read. Toni always seems to have her finger on the pulse of whatever is going on, or she's teasing out expat issues you previously couldn't articulate. Plus there's so much pathos and humour that you don't need to be an expat to enjoy she says about being a woman or a parent. I love that Toni takes her clever insights on the States, the long term expat life and family life in general and so easily turns them into witty, succinct posts on Expat Mum that always have me smiling and nodding my head in agreement. I also love that although Toni has been in the States over 20 years, she remains British enough to dissect the flaws of the States while also champion the wonderful about the country. Expat Mum is my top expat blog to read. Toni's blog is a perfect reflection of her - bitingly funny, smart and observant with sharp Northern (!) insights on life with her family in the USA. I admire her ability to span both frivolous and serious topics from both sides of the pond. I was lucky enough to find her blog - which became my daily bible - when I relocated to Chicago from the UK...an absolute must-read to prove to myself that I was not alone! Expat Mum's blog has been one of my favourites for over five years now. She is insightful, humorous and topical. She definitely deserves to win this award. Toni is undeniably the most entertaining expat blogger I have read... she has a unique ability to draw you in, fill you with insights and leave you wetting your pants! Toni's take on life is always insightful and great fun. Keep it coming Toni! Toni shares intercultural experiences in a humorous way that is both insightful and entertaining. It's one of the few blogs I've followed for years! I'm neither an expat nor a mum, but I *love* Toni's blog. I do have friends who live in Chicago, so can visualise some of the scenery, but even if not, Toni's vivid and witty writing really brings her stories to life. As an expat Brit living in France ( but who has lived in the US for a short time) I have only just discovered this blog which has fast become my favourite. Expat Mum's writing is witty and so very observant and I often feel she's just having a chat to me about her day. A must for anyone needing a good blog fix. As a fellow long-term expat, I love reading Toni's blog. I'd love it even if I weren't a fellow expat though - such good writing is always a pleasure to read. I've long been a fan of Toni's blog and find that her descriptions of the cultural gitches between the US and UK spot on. I just love this blog. I am a US expat living in the UK and she makes my day every time she posts!